HAD A SPECIAL RELATIONSHIP with Pope Paul VI that began with his election to the papacy. As soon as the conclave that elected him ended on June 21, 1963, Archbishop Coleman Carroll, Archbishop of Miami, announced that he was going to Rome for the coronation Mass and he invited me to accompany him even though I had become a priest of the Archdiocese only two years earlier. I had been dispensed from my solemn vows as a Benedictine in 1961 because the Archabbot of Saint Vincent Archabbey in Latrobe, Pennsylvania, had wanted me out of the Archabbey and the Order because I was an architect and did not approve of his building plans. The monastic chapter had voted down his project following my expression of disapproval in Chapter. I was promptly accepted by Archbishop Carroll as a priest in the Archdiocese. In February, 1972 I received my copy of the ACTA APOSTOLICAE SEDES, a Vatican publication that is analogous to the Congressional Record. In it I read that in September, 1971 Pope Paul VI had asked the Congregation for Bishops and the Congregation for Religious whether he should abrogate Canon 641. The Congregations met separately in October and jointly in November to consider the question and then recommended to the Pope the abrogation of Canon 641. The Pope accepted the recommendation. Two weeks later I was appointed Auxiliary Bishop. 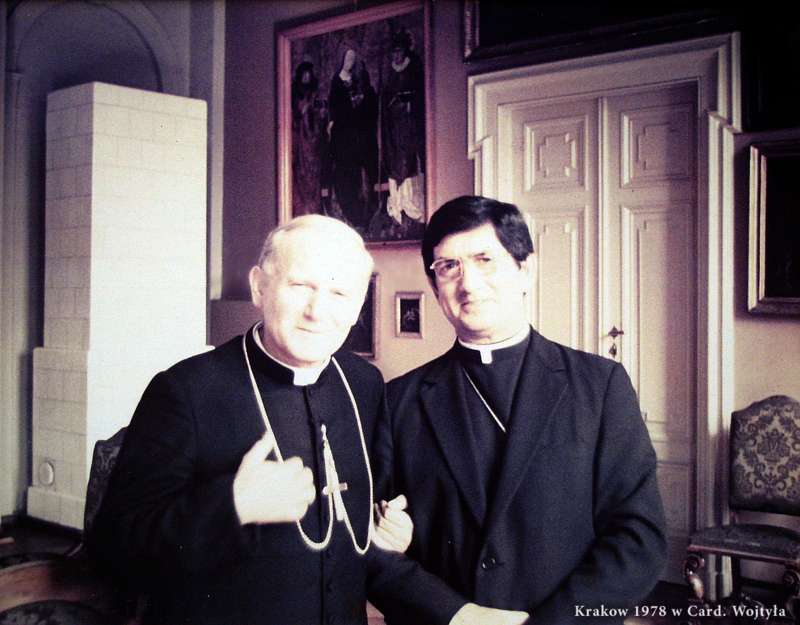 N THE FALL of 1978 I was invited by Cardinals Stefan Wyszynski and Cardinal Karol Wojtyla to visit them in Poland in my capacity as Chairman of the NCCB Committee on Migration. After visiting Cardinal Wyszinski in Warsaw, I motored to Krakow with a stopover in Czestochowa where I celebrated Mass. The next morning as I was leaving Czestochowa on the morning of 28 September 1978 a Pauline priest informed me that Pope John Paul had just died that night. I arrived at the residence of Cardinal Wojtyla a couple of hours later and on entering the Cardinal’s residence I greeted him and my first words were “Your Eminence I was shocked and saddened to learn just a couple of hours ago that our Holy Father Pope John Paul died this last night.” He replied, “Yes, Bishop Gracida, it is great loss to the Church.” Little did I realize that I was shaking the hand and speaking to the man who in just a few weeks would become Pope John Paul II. The photo was taken as I was leaving his residence two days later.